Objectives Lower limb isometric tests are used to assess strength and strength asymmetries and monitor reductions in muscle force that may contribute to loss of performance and increase injury risk. Isometric tests in the upper body may be appropriate to monitor neuromuscular performance of the shoulder joint in sports involving contact and overhead actions. The aim of this study was to determine the reliability of a novel upper body isometric strength test. Methods Eighteen elite rugby players (age 22.4±4.6 years; body mass 95.5±13.4 kg) were tested on consecutive days. 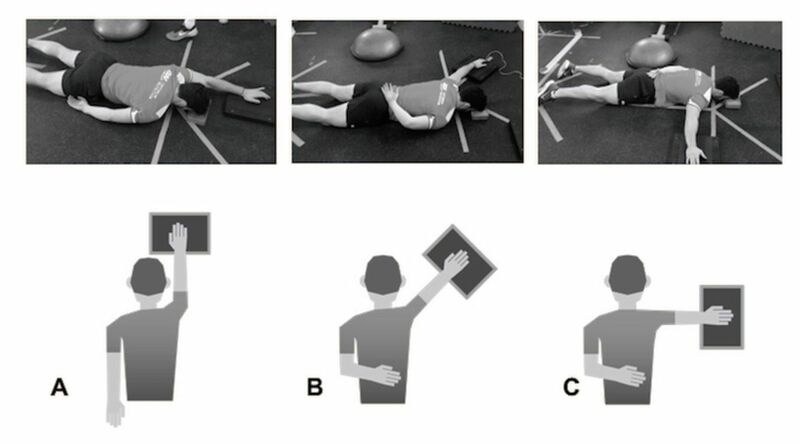 Maximal isometric contractions using both limbs against a force platform were assessed at three angles of abduction (180°, ‘I’; 135°, ‘Y’ and 90°, ‘T’), in a prone lying position. To evaluate interday reliability, intraclass coefficients (ICC) were calculated for mean net peak force (NPF) and highest NPF achieved in any trial (peak NPF). Intratrial variability was assessed using coefficient of variation (CV), and the standard error of measurement (SEM) was used to calculate minimal detectable change (MDC). Results Interday reliability for NPF was excellent in all test positions (ICC 0.94–0.98). The test demonstrated high absolute reliability values (SEM 4.8–10.8) and interday measurement error was below 10% in all test positions (CV 5.0–9.9%) except for the non-dominant arm I-position (CV 11.3%). Minimum detectable change was between 13.2 and 25.9 N.
Conclusion The Athletic Shoulder test demonstrated excellent reliability for each test position supporting its use as a reliable tool to quantify the ability to produce and transfer force across the shoulder girdle. The test is a novel reliable way of assessing shoulder strength to guide safe and asymptomatic return to arm tackling as part of a return to play process. The test can be used to quantify recovery of muscle function after exercise or training/match exposure when compared with a player’s normal values. It is suggested that this test forms part of a cluster of tests of shoulder function including strength, range of motion (ROM) and control, to ensure a comprehensive overview of all of the components relevant to the maintenance of shoulder stability. The primary aim of this study was therefore to establish the reliability and clinimetrics of a novel series of long lever upper body isometric force platform tests. Eighteen elite level male rugby players participated in the study. All participants were given a written explanation of test protocol and signed consent forms. Players were excluded if they had sustained an acute injury to the neck or shoulder girdle (<72 hours prior to testing), experienced symptoms after performance of the test that lasted longer than 20 min or worsening pain attributed to testing or if they were unable to adopt any of the test positions due to inadequate range of motion. Body mass, height and arm length (posterior angle of the acromion to wrist joint line) were measured (online supplementary appendix 1). All tests were performed with the subject prone on the floor with their neck position standardised using a 4 cm foam block on which the forehead was rested. The hand was placed on a vertical axis force platform (Pasport PS-2141, Pasco Scientific, Roseville, California, USA) connected to proprietary data acquisition and analysis software (NMP technologies, London, UK). In the I-test, the shoulder was positioned in full abduction (in line with the body), the forearm in pronation and the heel of the hand acted as the main contact point with the force platform. In the Y-test and T-test, the arm was in 135° and 90° abduction shoulder abduction, respectively. In all tests, the elbow was fully extended (figure 1). ASH test positions. (A) I-test (B) Y-test (C) T-test. ASH, Athletic Shoulder. After a standardised warmup consisting of two submaximal 80%–90% efforts in each of the testing positions,21 players performed three trials in each of the three different positions on the same limb. This procedure was then repeated with the contralateral limb. During pilot testing, we established that a 20 s rest period was the optimal duration required for full recovery between trials, having experimented with both shorter17 and longer21 recovery times. Subjects were required to maintain their scapula in a natural position relative to the elevated arm (avoiding excessive scapula upward rotation/elevation or anterior tilt). Subject position was checked prior to each trial to remove visible compensations . The contralateral arm was placed behind the back so that the elbow was unable to fix on the floor and provide antirotation trunk stability for the Y and T tests, but in an I-test the arm was allowed to remain by the subject’s side due to lower trunk rotational forces encountered. During performance of the test, the subject was required to stabilise their trunk against rotation without using the contralateral arm and push down from the shoulder through the heel of their hand. In the instance of a failure to perform the test according to the instructions, the specific trial results were discarded and an additional trial was performed after 20 s recovery. Tests were consistently performed in the following order: I, Y, T and then conducted on consecutive days at the same time of day. Completion of all three test positions for dominant and non-dominant limbs took under 6 min including recovery periods (each individual test position for one limb took 50 s for example, the dominant arm T-position). No further familiarisation or upper limb training was performed between the two test days or in the 72 hours prior to the first day of testing. In order to familiarise players with the test protocol, they performed a minimum of three complete tests on separate days prior to the study. Subjects were given standardised instructions and consistent verbal encouragement during the test,25 with a countdown prior to each of the efforts. On hearing the instruction, subjects were asked to push as fast and hard as possible to generate maximal force (aiming to achieve maximum force as fast as possible) and sustain it for the full 3 s test duration.17 21 Tests were excluded if there was a countermovement (the hand lifted from its resting position on the platform prior to pushing down), if noticeable compensatory strategies were used, such as excessive use of the lower limb to increase stability, anterior tilt of the scapula or elbow flexion26 or if the subject did not perform the test correctly. The two examiners (Strength and conditioning coach and Physiotherapist) were familiarised with the equipment and experienced with the test protocol. Eighteen elite male rugby players participated in the study (age 22.4±4.6 years; height 186.3±7.7 cm; body mass 95.5±13.4 kg (online supplementary appendix 1-table 2). Interday reliability for mean NPF was excellent in all test positions (ICC 0.94–0.98). The test demonstrated high absolute reliability (SEM 4.8–10.8) and interday measurement error was below 10% in all test positions (CV 5.0–9.9) except for non-dominant arm I-position (CV 11.3%). MDC90 values for the tests are presented in table 1. Reliability was higher when we compared mean of three trials ICC 0.94-0.98 to the maximum of three trials ICC 0.89–0.98 (online supplementary appendix 2-table 3.1 and 3.2). We evaluated a series of novel isometric long lever shoulder tests performed on a force platform and found excellent reliability (ICCs 0.94–0.98) in the three ‘IYT’ positions. There are no upper limb isometric force platform tests in the literature for comparison, but this compares favourably to the reliability reported for upper limb HHD tests such as internal and external rotation strength measured in a range of positions: standing, ICC: 0.92–0.9631; seated, ICC: 0.68–0.9932 and in multiple positions, ICC: 0.93–0.99.17 Athletic Shoulder (ASH) test reliability was also higher than peak force reliability in a lower limb isometric test (ICC 0.86–0.95),6 which also used a 3 s maximum effort against a force platform. Based on the criteria (CV<10%) used by McCall et al,6 and others, all test positions (CV 5.0%–9.2%) can be considered reliable, except for the non-dominant arm I-test (CV 11.3%).30 Therefore, practitioners can be confident that the force platform IYT tests are reliable in detecting between subject and within subject differences. In practical terms, high reliability does not necessarily mean that a test has the sensitivity to detect a real change,6 10 17 and MDC is useful in a monitoring context to establish how far ‘the needle needs to move’ before a change can be considered meaningful. IYT values for MDC90 were 13.3–25.9 N (MDC% ranged from 10.7 to 20.1), meaning that a change of >13.3 N in a dominant arm T-test would be considered meaningful with a confidence level of 90%. For comparison, MDC% 7.5%–19.3% was reported in HHD IR and ER strength tests in sitting, supine and prone positions,17 and MDC%≤17.8% in prone shoulder extension.33 Holt et al 34 (2016) compared average internal and external rotation strength in neutral using HHD with and without external fixation (EFD) and found the range of intrarater %MDC’s were lower for HHD (17.3%–19.7%) than EFD (19.3%–29.0%). McCall et al6 reported MDC90 of between 26.2 and 36.9 n across limbs and the two positions of a posterior chain isometric force platform test. Thus, the power to interpret change in the ASH test is comparable with relevant isometric tests in the literature. There were small differences in reliability between the three test positions, which could be related to different requirements of the subject to stabilise their trunk against rotational forces. Without randomisation of test order for each subject however, comparing reliability between test positions is not possible,19 and as such our study design does not allow this comparison. It could be argued that a standing test would be a more sports-specific position to evaluate the ability to produce force in a standing tackle. However, a standing test has greater potential for test-retest variability due to the additional degrees of freedom, while the prone position on the floor has the advantage of minimising the involvement of other body segments, which could explain the high reliability observed. The excellent reliability reported in the current study could also be related to the removal of inconsistencies outlined by other authors.19 In addition, trials were discarded if there were visible compensatory strategies. The duration of the test and the rest period between trials can influence results.26 In pilot testing, we determined that 20 s was the minimum optimal rest period needed for subjects to consistently repeat a maximum effort without deterioration in scores across the three trials. In other studies, test duration ranged from 3 to 5 s, with rest periods ranging from 10 s17 to 5 min,33 factors that may have influenced intratest reliability. The authors recommend that the full ASH test protocol be completed in preseason to establish individual baselines for comparison (duration 6 min excluding standardised warmup). In-season monitoring can focus on one or two positions (duration 2 to 4 min) to reduce time requirement. Although the method required that players were familiarised prior to testing to minimise any learning effect and 72 hours rest prior to the study protocol, it is possible that small increases in mean NPF between day 1 and day 2 were influenced either by a learning effect or additional recovery time. This emphasises the importance of familiarisation prior to interpretation of test results. It is important to recognise that results were obtained from elite male rugby players and therefore clinimetrics need to be verified in other populations. The portability, simplicity and rapid implementation of the test in a gym/training environment means that it has the potential to be used; with individual athletes during rehabilitation to assess progression in force production following injury; to inform return to competition decisions and to regularly monitor recovery of shoulder performance following competition induced fatigue in groups of athletes. Further work is needed to evaluate the sensitivity of the ASH test to competition induced fatigue and the profile of strength decrement and recovery as has been demonstrated in isometric lower extremity testing.6 Preliminary data in the present group of athletes suggest that the test may be a useful tool in this capacity as we noted ASH test strength deficits at 48 hours after a competitve rugby game with recovery at 72 hours. We have also observed changes beyond the 25 N MDC threshold in a variety of glenohumeral as well as cervical spine rehabilitation cases. However, further studies that show the sensitivity of the ASH test to alterations in training load, relationship to injury and the response to rehabilitation are the necessary next steps in determining the usefulness of this test across a wide range of environments. NPF was highest in the I-test followed by Y-test and T-test, respectively, and it may be of interest to determine normative ratios across the IYT positions in relation to sport and injury risk in larger samples. The ASH test protocol demonstrated excellent repeatability in each test position, supporting its use as a reliable tool to quantify the ability to produce and transfer force across the shoulder girdle. Establishing individualised baseline scores and normal error (SEM and MDC) for players will permit longitudinal monitoring of change. The test may be used to benchmark performance in case of shoulder injury and to track progress during rehabilitation. It also has the potential to be used alone or in conjunction with other measures of upper limb force production to quantify athlete’s readiness to perform in sports that require repeated or high intensity upper limb actions. The authors would like to thank the players of Saracens Rugby Club for their assistance and co-operation during the test period.
. Reliability and validity of a new device to measure isometric strength in polyarticular exercises. J Sports Med Phys Fitness 1999;39:113–9.
. Spreadsheets for analysis of validity and reliability. Sportscience 2017;21. Contributors Conception and design: all authors. Acquisition of the data: PH, LT. Analysis and interpretation: all authors. Drafting, critical revision and final approval of the article: all authors. Statistical expertise and collection and assembly of data: BA, NS, DDC. Agreement to be accountable for all aspects of the work in ensuring that questions related to the accuracy or integrity of any part of the work are appropriately investigated and resolved: all authors. Disclaimer We wish to assure the editors that all authors included on this paper fulfil the criteria of authorship. We also provide our assurance that there is no one else who fulfils the criteria that has been excluded as an author. Competing interests Daniel Cohen is a shareholder in NMP technologies Ltd. who have commercialised the ‘ForceDecks’ proprietary software used in data acquisition and analysis. Ethics approval The ethics committee of the Faculty of Medicine of the University of Santander.